It has long been assumed that lightning bolts either leap from a cloud to the earth or flash from cloud to cloud. However, it now appears that on rare occasions bolts originate at the tops of storms and travel upward into clear sky. Such a large upward bolt has been caught on top of a storm cloud by Frankie Lucena @ Cabo Rojo,Puerto Rico. The upward bolt featured in the above picture was produced by a Storm cell located in the Caribbean Sea, southwest of Cabo Rojo, Puerto Rico. These types of bolts sometimes produce Gigantic Jets, which is a type of transient luminous event (TLE). However, how the mysterious and rare upward strokes fit into the global pattern of electric circuitry is not clear. Indeed, it has not been yet established if they reach into the ionosphere. 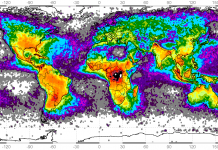 The reported heights of the tops of these strokes – about 120,000 feet – are about six miles short of the lowest part of the ionosphere. But in 1956, the Scottish atmospheric physicist C.T.R. Wilson, proposed that electric discharges through low pressure air, such as that at high elevations, would not produce bright flashes. Thus the upper parts of the bolts may not be seen. Dr. Wilson, whose cloud chamber for detecting tracks of atomic particles won him a Nobel Prize in Physics, had proposed earlier that worldwide thunderstorms transport negative electric charge from the ionosphere to the earth’s surface. This, he said, balances the observed fair weather flow of negative charge from the ground to the sky. This role of storms was confirmed in 1948 when an Air Force B-29 bomber carried instruments of the Department of Terrestrial Magnetism of the Carnegie Institution of Washington over more than a score of thunderstorms. It recorded a flow of roughly one ampere downward from the sky over the storm. 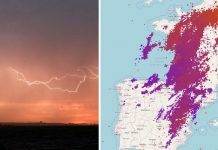 From this it was estimated that, on the average, as many as 3,600 thunderstorms may be occurring worldwide to maintain the observed negative charge on the earth. How the rare upward strokes fit into the global pattern of electric circuitry is not clear. It is not yet established that they reach into the ionosphere. Maybe this photograph and video will help further understandings of this weird sky phenomenon. 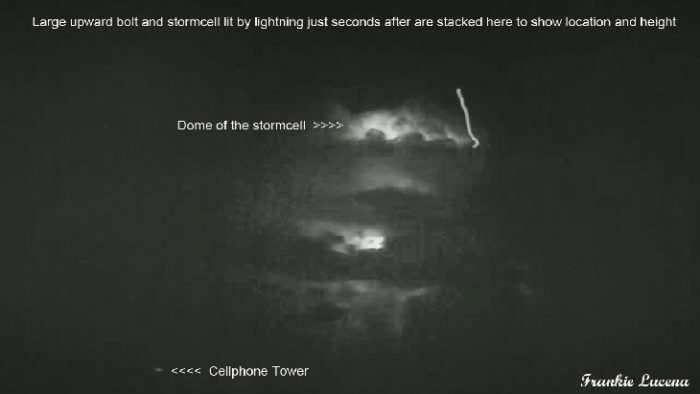 One thing is sure, these types of bolts sometimes produce Gigantic Jets, which is a type of transient luminous event like Sprites and Blue jets. 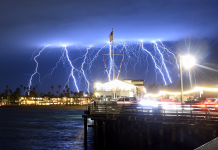 It seems that the more we look at lightning behavior, the more complicated it gets.